"Everyone is looking for the real in whatever they endeavor. Garrison Wynn went out looking for real answers to real success challenges--and he found them. If you want them, get this book real fast!" --Jeffrey Gitomer, New York Times and Wall Street Journal bestselling author of The Little Red Book of SellingLife and business aren't fair,which is good. If they were, you couldn'tseize the unfair advantage. Think about it. Is your CEO the smartestperson in the company? Is the head of yourdepartment more driven than you? Does theleading company in your industry make thebest products? Probably not. They all have onething in common, though: They're on top ofthe pile because they discovered and exploitedtheir unfair advantage-and with the helpof business expert and motivational dynamoGarrison Wynn, you can do the same. The Real Truth about Success is the culminationof ten years' worth of interviews with morethan 5,000 top performers in their fields.During the process, Wynn discovered thatbetter brains, a positive attitude, and superiorall-around quality rarely drive true success.Rather, the most successful people inthe world leverage their unique, distinctivequalities-whatever they may be-to propelthemselves to the front of the line. 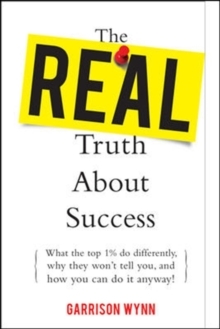 In The RealTruth about Success, Wynn helps you:Discover (or create) your ownpersonal advantageAlign it with the most appropriate goalsTransition from self-knowledge to repeatableimplementationRelentlessly put your advantage to practical useBask in the sunshine of well-deserved successAll of us have a personal advantage we canuse to stack the cards in our own favor.What's yours? High intelligence? Good looks?Likability? Great connections? (Your unfairadvantage may well be a talent for leveragingother peoples' unfair advantage. 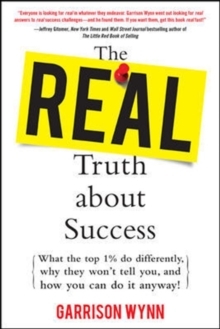 )Refreshingly (sometimes brutally) honestabout what it takes to get to the top, The RealTruth about Success blows the lid off the secretof their success-so you can make it the secretof your success.